All the Charlottesville conspiracy theories from Trump's Friends in the lunatic fringe. Far-right media voices have been tripping over themselves to “all lives matter” the veritable Klan rally and deadly white supremacist assault that took place over the weekend in Charlottesville. Unsurprisingly, the far right has used its elevated status in Trump’s America to find the real culprit for this weekend’s hate crimes: George Soros. Previously fringe voices—such as the Trump-endorsed conspiracy theorist Alex Jones—have pointed to the events in Charlottesville as further evidence of an all-pervasive globalist plot to do various bad things, with the progressive fundraiser Soros at the helm. With Trump’s own Department of Justice investigating the alleged attack by James Fields Jr. as a civil rights case, it’s been hard for these voices to pin Saturday’s car attack itself on an elaborate globalist plot. But Jones and a number of Trump’s most vocal other acolytes have been quick to define the broader “Unite the Right” rally that ultimately instigated the violence as perhaps secretly a product of some “deep state” cabal, rather than the work of people with sincerely held racist views, such as the idea that confederate monuments are an inherent good. In an hour-long video, Infowars host Alex Jones charges the entire event was orchestrated by Jewish financier George Soros, and his progressive allies in government and the nonprofit sector. Their goal? To discredit conservatives and, ultimately, place the entire United States under authoritarian military control. Jones charged, providing no evidence, that the Southern Poverty Law Center had hired actors to dress up like white supremacists and play to the cameras, followed closely by antifa protesters, who Jones insisted were bused in by Soros. Other goals elaborated by Jones included the assassination of Trump, banning online speech by conservatives and libertarians, and generally demonizing those with right-leaning political views. “A false flag doesn’t mean it was purely staged,” Jones said in a subsequent video. Previously, Jones has said that the government purely staged the Oklahoma City Bombing, the 9/11 attack, and the Sandy Hook elementary school massacre, among other events. Rather than saying the attack itself, which will be investigated by Trump’s own DOJ, was fully staged, Jones and his cohort seem to be offering a more generalized notion that the white nationalists at this weekend’s events were not representative of the ordinary nationalists that make up Trump’s political coalition and that the uglier ones may have even been plants. 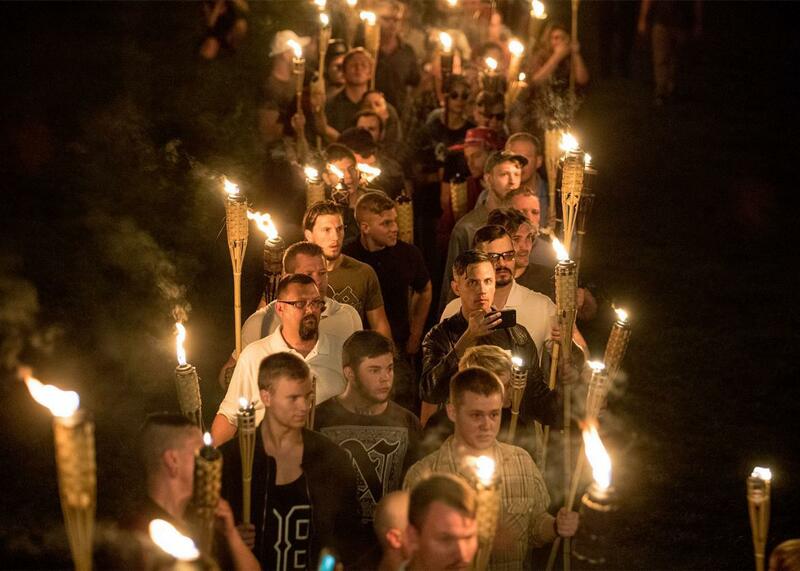 Julian Assange compared the torch-lit rally in Charlottesville to ones that took place in Ukraine in 2014, which he and alt-right voices also claim were Soros-funded affairs meant to foment the breakdown of civil society. His old boss, Steve Bannon, is now one of the most senior officials in Donald Trump’s government.